Daily Illuminator: Tomorrow Brings So Many Wonderful Toys! January 28, 2013: Tomorrow Brings So Many Wonderful Toys! It's a new year, the holidays are long over, and it's time to end January getting what you really want. 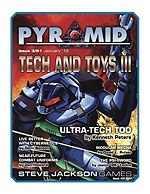 It's time to toss away that humdrum cutting-edge gear and get the even better stuff with Pyramid #3/51: Tech and Toys III, the latest installment of Pyramid. This issue includes contributions by both authors of GURPS Ultra-Tech: Kenneth Peters presents material there wasn't room for in that volume (with the cleverly named "Ultra-Tech Too"), while David L. Pulver pushes the GURPS Spaceships line into new realms of automatonic action with "Modular Mecha." Within these packed pages you'll also get a look at armor and defense of the near-future, a souped-up-servo serving of cybernetics, and GURPS Assistant Line Editor Jason "PK" Levine's succinct but scintillating psi-sword. And we won't even mention the other cool stuff we tuck into the glovebox of every issue of Pyramid. The stores of tomorrow are glittering with countless possibilities; pick up this issue individually, or start your subscription today with this catalog of coolness!